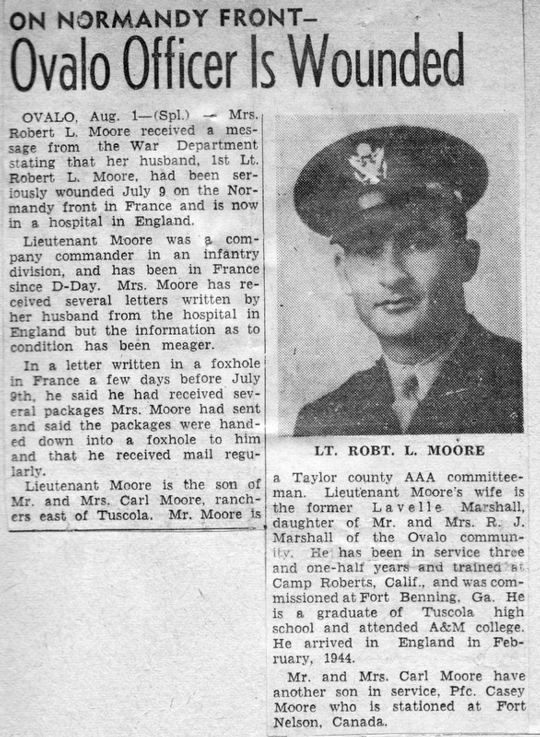 Robert Lee 'Bob' Moore, son of Carl Henry Moore and Annie Lee Wilkinson, married to LaVelle Mae Marshall and buried in Weimar Masonic Cemetery, Weimar, Colorado County, Texas. ROBERT L (Bob) MOORE, 91, died on August 1, 2009, in Schulenburg, TX. Well known in the Weimar and Schulenburg areas for his involvement in church, education and agriculture, Robert was a long-serving teacher, enthusiastic supporter of community and school activities, relentless conversationalist, avid storyteller, and a friend to all. He was preceded in death by his beloved wife LaVelle Marshall Moore, father Carl Moore, mother Annie Wilkerson Moore, mother Coreen Casey Moore, sister Marie Thomas, brother Casey Moore, and sister Margie Hopson. He is survived by his children, Linda Hartman and husband Henry Hartman, Larry Moore and wife Nan Combs Moore, and his grandchildren Adam Moore, Steven Moore, and Craig Moore. He is also survived by sisters/brothers in law Murlee Moore, Lota Clyde & Doyle Marshall, Roy Peoples, and many cousins, nieces, & nephews. Born and raised in West Texas near Tuscola, Texas, Robert attended Tuscola High School and obtained degrees from Texas A&M and Sam Houston State. 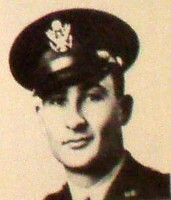 He served in the U.S. Army from 1940-1945. As a 26-year old company commander, Robert led his infantry company onto Omaha Beach and through France as part of the Allied invasion. After recovering from serious injuries, Robert rejoined his company for the final push through Germany. He was awarded the Bronze Star and two Purple Hearts. In 1942, Robert married his sweetheart, LaVelle Marshall. The Moores moved to Weimar in 1947, where Robert began his 35-year career as the vocational agriculture teacher. He influenced the lives of several generations of students. He enjoyed part-time ranching, fishing, high school and Aggie sports, and having fun with family and friends. For over 60 years, he was an active member of the First Baptist Churches of Weimar and then Schulenburg. He supported many school and community organizations and was a lifetime member of the Weimar Rotary Club. After LaVelle's long battle with Alzheimer's ended in 2001, Robert became an active resident of the Regency Villas community in Schulenburg. He never lost his persistent optimism, contagious humor and uncanny ability to always squeeze in one more story. A memorial service will be held at 10 AM on Tuesday, Aug 4 at the First Baptist Church of Schulenburg. The family suggests donations to the Robert L Moore Scholarship Fund in C/O the Hill Bank & Trust, PO Box 157, Weimar, TX 78962, or the First Baptist Church of Schulenburg, 110 Upton St, 78956.